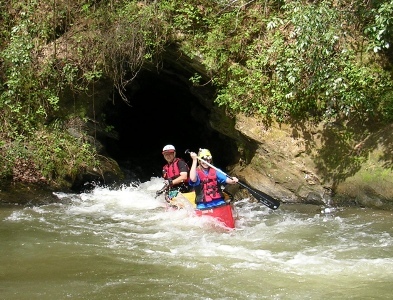 The first half of this section is punctuated by several small class I rapids suitable for new paddlers with the exception of the tunnel. At the midway point there is a .18 mile tunnel on river left. Helmets are required, and flashlights are recommended. Inside the tunnel is a class II rapid that you never see coming. At 5.80′ river level, canoeists have been know to encounter the tunnel ceiling with their heads. This prompted some great quotes like, “I’ll never do that again” and “It was a lot scarier than I expected”. Knee deep at the tunnel entrance is a good to high level. Bending over, you should be able to see daylight at the far end of the tunnel. 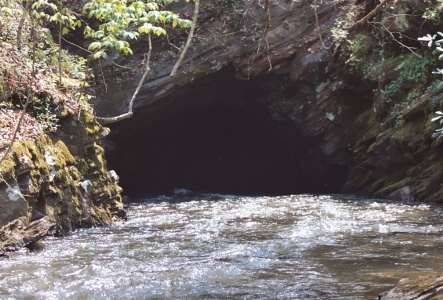 Try to avoid having multiple canoes and kayaks inside the tunnel at the same time. This is hard to do. The people at the entrance can not tell when the tunnel is clear. Voice or whistles will not work for communication through the tunnel because of the distance and noise from the rapid. Walkie-Talkies don’t work because of the mountain between the entrance and exit. Cell phones have VERY limited service there. Text messages might work. At medium to higher levels, canoe paddlers can hit their head on the tunnel ceiling. The worst area for hitting your head seems to be at the area of the drop. Apparently, there was a slight vertical mis-alignment in the tunnel about 1/3 the way through. If you are in a canoe, duck and wear a helmet! After the tunnel, the river flattens out with just a few ripples left until the take out. Max Gradient: 75 fpm <<< Inside the tunnel! On GA400, drive North past North GA Premium Outlet Mall in Dawsonville. From GA400 Tun left on Burnt Stand Rd. That will dead end into Auraria Rd (State Route 9E), turn right. Drive .6 miles and Castleberry Bridge Road will be on your left. Follow that to the put in. Parking is fairly limited here. From the put in, go back to Auraria Rd. and turn right (South). Drive 6.5 miles to Hwy 136. Turn left. Drive .7 miles to the river. Parking is more plentiful there. Location: At the end of GA400, turn left. Drive 3.5 miles and they will be on the left. 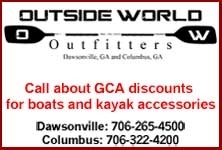 Location: 1/4 mile South of the Dawsonville outlet mall on the East side of GA 400.